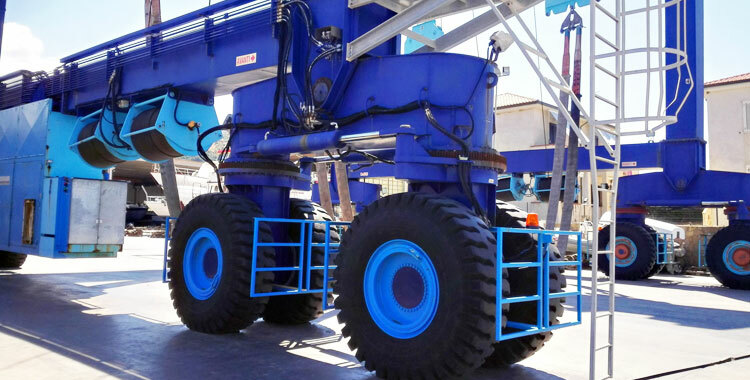 Marine hoist is a kind of non-standard crane mounted to tires, allowing you to position it anywhere you want. 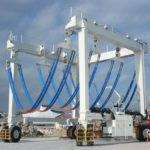 The marine hoist crane is capable of lifting and transporting large boats and ships going up to 1200 tons. 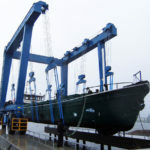 This particular crane is commonly found in shipyards, harbors, docks, yacht clubs, water recreation centers and so on to handle a variety of vessels as well as facilitate the efficiency of boat handling. 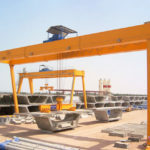 Ellsen machinery is fully responsible for the marine travel hoist crane design and manufacturing so as to provide you with safe, efficient and economical vessel handling equipment. 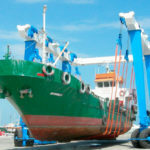 We provide both standard and custom marine hoists for your requirements. 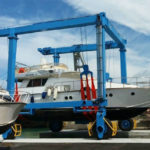 Basically, the marine hoist lifts can be classified into yacht lift, sailboat travel lift, wooden boat lift and so on according to the type of vessels to be hauled; small boat lift, light duty boat hoist and heavy duty travel lift according to the work duty; remote control marine lift and cabin control marine hoist according to the control mode; hydraulic boat lift and electric boat hoist according to the power source. If you are not sure which type of marine hoist will work for you, please feel free to contact us online or send us an email. Our experienced engineer will assist you to select the right type for your applications. In terms of carrying capacity, there are an array of marine travel hoists for your choice. 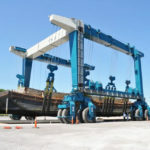 Typically the boat lift crane capacity ranges from 10 tons to 1200 tons. Here are some popular models with standard configurations for your reference. 50 ton marine hoist – span: 8m, overhead height and width: 9.3*9.46m, dead weight: 40t, lifting point (number of straps): 4(2/4pcs), lifting speed (in full load state): 0-1m/min, travelling speed (in full load state): 0-20m/min, number of steering bogies: 2, steering mode: fixing axle steering, operation mode: remote control. 100 ton travel lift – span: 10.5m, overhead height and width: 9.8*12m, dead weight: 60t, lifting point (number of straps): 4(4pcs), lifting speed (in full load state): 0-1m/min, travelling speed (in full load state): 0-20m/min, number of steering bogies: 2, steering mode: fixing axle steering, operation mode: remote control. 150 ton travel lift – span: 12.65m, overhead height and width: 13.8*15.6m, dead weight: 83.5t, lifting point (number of straps): 8(8/16pcs), lifting speed (in full load state): 0-1m/min, travelling speed (in full load state): 0-20m/min, number of steering bogies: 4, steering mode: fixing axle steering and 90 degree steering, operation mode: remote control or cabin control. 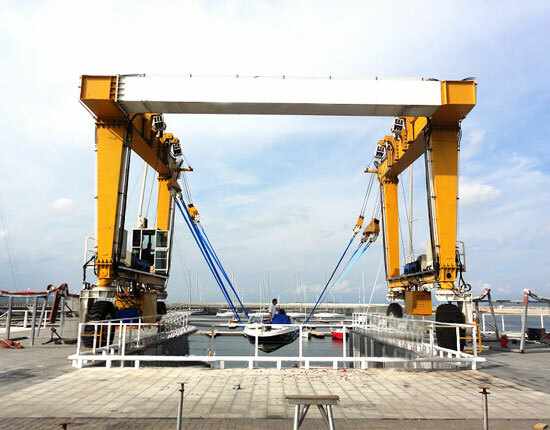 300 ton marine travel lift – span: 13.5m, overhead height and width: 12.3*15.96m, dead weight: 150t, lifting point (number of straps): 6(6pcs), lifting speed (in full load state): 0-1m/min, travelling speed (in full load state): 0-20m/min, number of steering bogies: 4, steering mode: fixing axle steering and 90 degree steering, operation mode: remote control or cabin control. If you would like to know more details about marine hoist specifications, contact our sales team now! Our marine hoist is available in flexible design that enables it to meet different boat configurations. Variable span: it allows you to adjust the travel-lift span so as to accommodate the boat size. Movable lifting point: the lifting points can be adjusted to balance the load equally and keep the multiple lifting points raise synchronously. Other options include various amplitude cross beam, variable width and variable lifting stroke. 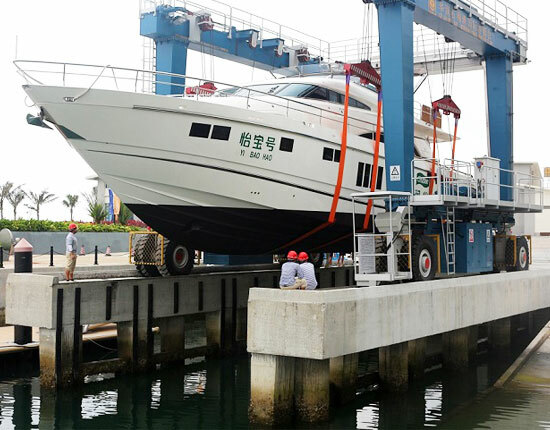 The marine hoist performs a few main functions including hauling a boat in and out of water, moving and arranging ships in the yard to improve the space utilization, transporting the hull of a boat in shipyard for repairing or maintenance. 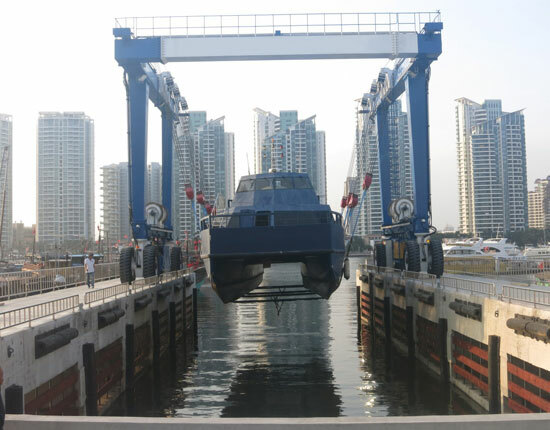 Our marine boat lifts hoists are meant for the utmost efficiency, productivity and cost effectiveness of your businesses and also to provide excellent safety for staff that involve in the operation of the boat crane. Additionally, this boat hoist is engineered with great mobility, which enables you to position it anywhere you desire. Built with good mechanical condition and high quality components, the marine boat hoist will surely function properly and get your job done quickly and safely. 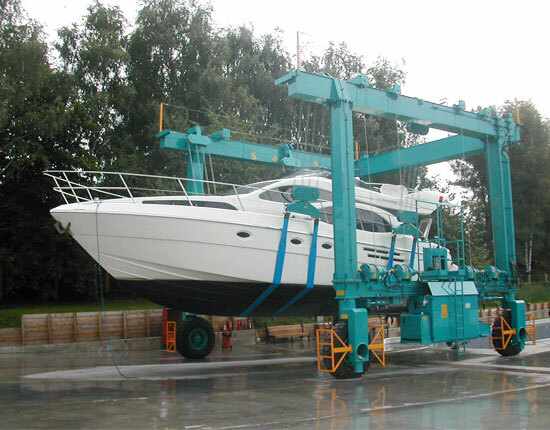 Our marine hoists are designed with a range of carrying capacity, widely applied in small to large marinas, shipyards and commercial yards. These cranes can handle a variety of vessels, such as small fishing boat, sailboat, powerboat, large yacht and tug. Depending on the size and weight of your boat, we will design the optimal solution for your business. This boat handling equipment consists of a number of components and parts that perform the lifting and transporting functions, such as U-shaped gantry frame, marine hoist winch, steering system, lifting points, pivot pin system, hydraulic transmission system and control system. Gantry frame – the rigid upper cross beam can be extended to provide an increased clearance. Marine hoist winch – it provides independent and synchronized control of lifting points. Lifting points – the lifting points are moveable and adjustable to achieve synchronized raising and lowering of loads. Steering system – fixing axle steering and 90 degree steering system delivers excellent maneuverability. The enclosed design provides maximum protection in the harsh marine environments. Pivot pin system – it provides excellent assistance when travelling on uneven ground. Hydraulic transmission system – our marine hoist is built with low energy consumption. Control system – remote control or cabin control configuration for optimum safety. 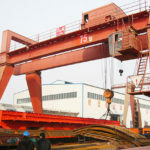 We are recognized as a trusted lifting equipment manufacturer and supplier in China through providing high quality products and dependable services for years. We focus on the travel lift crane quality in order to help you handle large vessels with excellent stability and efficiency. 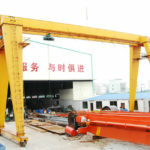 Our crane also features maximum cost effectiveness since we are able to offer a factory price to clients. In addition, we offer fast and professional technical support to fix any problem you have with the boat handling. To obtain a marine hoist at competitive price, contact us online or send email to us now!